The other week we noted an occasional quirk in financial reporting, where numbers a company announces in its earnings release don’t match what the company actually files in its 10-K or 10-Q several weeks later. Today we have another example of that phenomenon — except this time that difference comprises almost all the company’s net income reported for the year, and clearly that detail sailed right off the radar screen of most investors. The company in question: Virtu Financial ($VIRT), a financial services firm in New York with $1 billion in annual revenue. Here’s what happened. On 8 Feb. 2018, Virtu filed its earnings release for 2017 full-year results. There on Page 10 of the release, Virtu reported that net income attributable to stockholders of $17.33 million. (Total net income was $33.29 million, but Virtu had to deduct the non-controlling interest portion of $15.96 million.) See Figure 1, below. The net income number is highlighted in yellow. On 13 March 2018, however, Virtu filed its Form 10-K. There, we can see that net income attributable to shareholders was only $2.94 million. That’s $14.39 million of net income vaporized, a decline of 83 percent. See Figure 2, below, with the net income number highlighted in grey. Much of the answer lies in the line-item just above net income: provision for income taxes. In the earnings release, Virtu reported its provision for income taxes at $78.13 million. By the time Virtu filed its 10-K five weeks later, its provision for income taxes stood at $94.26 million — a difference of $16.13 million. 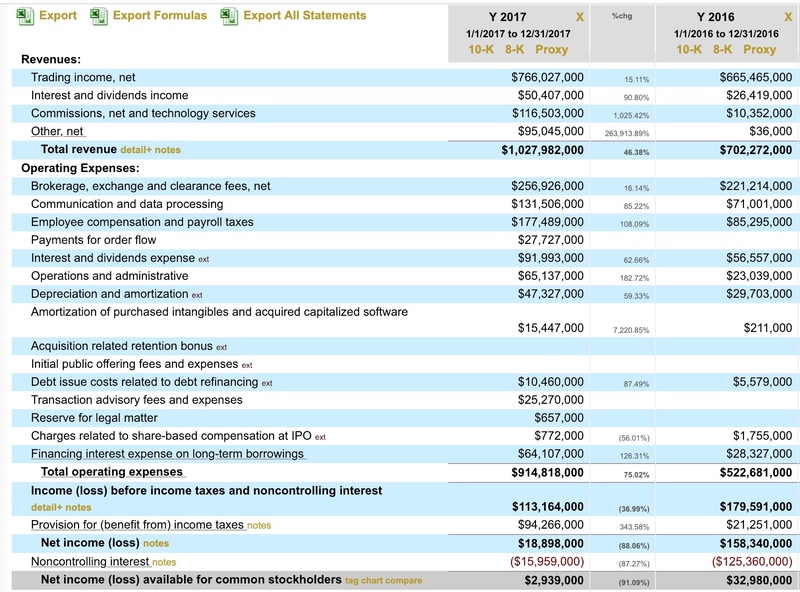 Virtu also fiddled with a few other numbers here and there on the income statement. For example, interest and dividends income dropped by $3 million, while commissions on technology services rose by $5 million. The ever popular “other, net” also rose by $1.7 million. 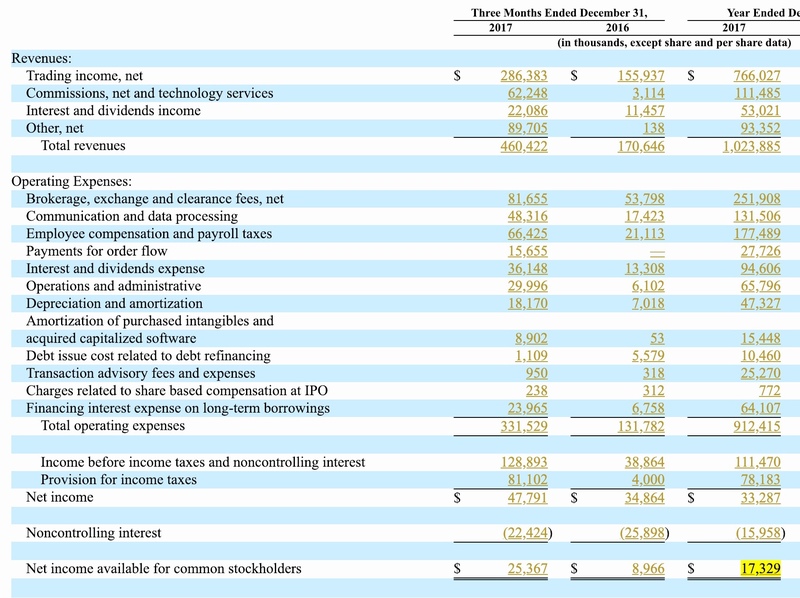 Add up all those fluctuations, and Virtu’s net income pretty much evaporates for the year. We aren’t entirely sure why Virtu’s tax bill changed so much. That was the first year companies were starting to report after the sweeping corporate tax cut from December 2017, so lots of revaluations were happening. You can investigate further on our Interactive Disclosure Viewer if you’re curious. Equally interesting is what happened with Virtu’s stock price. We looked it up. On Feb. 3, the day of the earnings release and reported net income of $17.33 million, Virtu’s stock jumped 22 percent, from $21.65 tyo $26.50. And on March 13, when Virtu dropped the whole 10-K and net income dwindled down to $2.94? The stock opened at $32.80 and closed at $32.95. In other words, nobody cared. But small discrepancies like that add up over time, and people start to care sooner or later. Here at Calcbench, we advocate for sooner.